Former Barack Obama supporter Jim Cramer on Friday said the stock market would have a huge rally if Scott Brown defeats Martha Coakley in Tuesday's special senatorial election in Massachusetts. 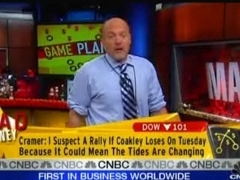 "I think investors who are nervous about the dictatorship of the Pelosi proletariat will feel at ease, and we could have a gigantic rally off a Coakley loss and a Brown win," said Cramer on Friday's "Mad Money." "It will be a signal that a more pro-business, less pro-labor government could be in front of us." JIM CRAMER, MAD MONEY HOST: We know it's earnings season. You can no more avoid it than you could avoid getting your report card or worse - your parents getting your report card. You saw that today when people sold the market on allegedly weak earnings from Intel and JP Morgan, emphasis on allegedly. The Dow getting hurt bad, down a hundred big ones. S&P giving back more than a percent. But that doesn't mean that the most important factor in next week's game plan is an earnings report. Far from it. Come with me. The number you need to watch is the number that Scott Brown racks up against Martha Coakley in this amazing Massachusetts Senate race. I say amazing 'cause this was supposed to be a walkover. I mean, even a few weeks ago it was a lock for Democrat Coakley. But now everything's up in the air, and a Brown win would be devastating for the president's agenda. Let's put Brown, okay, and I don't mean UPS which I happen to own for my charitable trust. Particularly on healthcare reform, because Republican Brown has said he will definitely vote against the plan. What does a Brown election mean larger than this? Well, first you're going to get a knee-jerk rally in all the so-called penalized stocks -- the HMOs, the drugs, the medical device-makers. I call it "knee-jerk," though, because these stocks have been on fire for months. Look at Cramer fave WellPoint, or United Health. 52 week high. 52 week high. Merck, 52 week high. It's been clear as a bell that the healthcare reform wasn't going to affect most healthcare stocks. That's versus what we thought last year. More important, though, I think investors who are nervous about the dictatorship of the Pelosi proletariat will feel at ease, and we could have a gigantic rally off a Coakley loss and a Brown win. It will be a signal that a more pro-business, less pro-labor government could be in front of us. Hey, would you say it is more China like perhaps? No, we can never be as capitalist as the Communist Chinese. But how about a little bit less like the old Soviet Union? Yeah, that would be a bit more like it. Pelosi politburo emasculation! Everything from the banks, which are usually in the Democrats' penalty box, or the oils which are despised by this administration for being carbon, could be propelled dramatically higher all of this Tuesday night.